Some times trips of this nature veer off course. In this case, that's not a bad thing. What began as a quick golf getaway turned into much more. Bring along the wife and daughter, who possess absolutely no interest in golf, and suddenly the vacation splinters in other directions. With an opportunity to play one of the best regulation courses in the Lake Tahoe region, along with the chance to tee it up at one incredible 18-hole executive course, we traveled along scenic Highway 80 for a mid-August getaway. The destination was Incline Village, a cozy location where people ski in the winter months or stake out a place in summertime along the white, sandy beaches near the brilliant blue waters of Lake Tahoe. Nothing against Lake Tahoe's south shore, which certainly has its own charm, but the north side of the well-endowed lake (22 miles long, 12 miles wide, maximum recorded depth of 1,645 feet) is much more reserved, a less crowded location with low-key casinos and a slower pace of life. It lends itself to a more relaxing vacation, although there is more activity than anyone can probably cram into a week's stay. The area must have been appealing to famed golf architect Robert Trent Jones and his son. 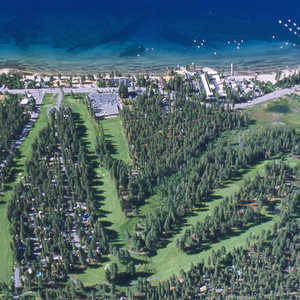 The two collaborated on the beautiful Incline Village Championship Course. Robert Trent Jones, Jr. designed the Mountain Course at Incline Village, a superb executive layout. As mentioned earlier, this was not strictly a golf getaway. And it shouldn't be, even for the most ardent golfer. There are too many activities to pursue between the months of June and October when the weather is practically ideal. Although the area certainly isn't cheap, there are plenty of options to call home for a week or so. One of the more popular locations is along Lakeshore Boulevard. As one might expect, the shoreline rests a short walk from most rental locations. Our spot was among a group of gated condominiums across from the Hyatt Regency, which is currently in the midst of a $47 million renovation. Our condos had no name. However, just mention 999 Lakeshore and people seem to know the location. The large two-bedroom condo included a full kitchen, fireplace, sizable balcony and nice lower deck, both appropriate for lounging or entertaining. Perhaps the best part was location. Walk about 30 yards and the gentle waves of Lake Tahoe are at your feet on the private beach. For gamblers, the Hyatt is a brief walk across the street. It's a suitable place to stay as well with 458 guestrooms, casino, lobby and three restaurants. A new movie theater will be added, along with a specialty restaurant and spa. The Hyatt also owns lakeside cottages across the street and operates the highly acclaimed Lone Eagle Grill, a fabulous restaurant (visually and food-wise) with a stunning beachfront view. It serves both lunch and dinner. Beware of the enticing aroma day or night. Even someone not contemplating a meal might find themselves eating after walking anywhere near the Lone Eagle. A 10-minute drive from Incline Village puts visitors in the prime north shore gambling area, where small casinos like the historic Cal-Neva Resort reside. Cal-Neva also has fine dining with a lake view and some interesting history. There has always been a hint of mob connections to the lodge, which was owned by Frank Sinatra for about eight years during the 1960s. Sinatra and his "Rat Pack" buddies often called Cal-Neva home. Among their frequent guests were Hollywood stars like Marilyn Monroe. The celebrity ballroom was built by Sinatra and bares his name. "Old Blue Eyes" also built a secret maze of tunnels that led to his private lake-view chalet. Owner Charles Bluth has completely renovated Cal-Neva, which now harbors an intimate casino, 220 rooms, and has a dynamic Euro Spa area that is guaranteed to relax even the most uptight guest. For some family daytime fun, take a trip to the nearby Ponderosa Ranch. A hay-wagon, western breakfast is served along with lunch at Hop Sing's kitchen. A comedy western cowboy show and tour of the Cartwright house can also be accomplished. It's a must-see for young kids and any fan of Hoss, Ben, and Little Joe. In the evening, try a sightseeing dinner cruise out to Emerald Bay. The M.S. Dixie takes couples or families on a two-hour paddle-wheel experience, which departs from Zephyr Cove. There is a 360-degree panoramic view of the lake around sunset, plus a dining experience that is first rate. Meat-lovers try the steak, it's tender and sizable. Another evening of fun is the annual Shakespeare festival at Sand Harbor, which runs through Aug. 27. Situated on the shores of North America's largest lake, the amphitheater comes to life with accomplished actors from the Foothill Theater Company. A food court with a lot of variety in food and drink add to the experience. Considering all the choices, squeezing in some golf can be difficult, especially without a reservation. Don't plan on just showing up at either course between June and August. Make a reservation and be on time. Even singles can find themselves in for a long wait at these popular courses. The suggestion here is warm up with the Mountain Course. Thanks to an assortment of distances at the course's 14 par-3 holes, there is plenty of opportunity to test many of the irons in the mountain air. The par-58 course resides at about 6,200 feet, which means the ball typically travels further. Although at times I question that theory, the Mountain course does provide a barometer for what lies ahead at the Championship layout. A day to test the irons was doubly important for me, considering I had recently purchased a set of the popular Wilson Fat Shafts. As advertised, the clubs keep the ball on a straight flight path and add distance, as much as 15 to 20 yards. So club selection for me became a true guessing game both days. Locals enjoy the Mountain Course layout so much they voted it the top golf course in the area. Even for the hard-core golfer who wants to hit a driver all the time will enjoy the experience. There are four par-4s where a driver can be used. 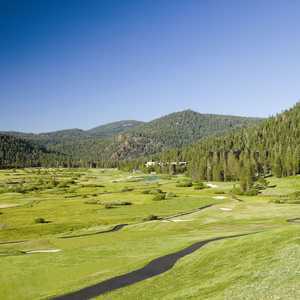 And like much of the Tahoe area, the setting is gorgeous on a course with no artificial landscaping. The Mountain Course measures 3,512 yards from the back tees and can also be played at 3,002 yards. Creeks run through much of the course, which resides in a peaceful, hilly setting with towering pine trees and views of the lake. Accuracy is crucial and trusting the "right" club is a must. Every hole has a distinctive character and shots must be straight and on target. The greens run relatively fast and roll true. With the warm-up round in the past, it was time to head a short distance away to the Championship Course. The course is inhabited mostly by local golfers who own a decided edge in obtaining tee times. 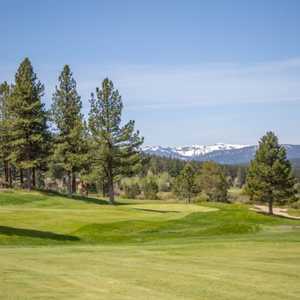 Much like the area ski resort at Diamond Peak, the locals like to claim this golf course for themselves, preferring to keep both locations a secret. "You can't beat the beautiful Robert Trent Jones layouts," said Bobby Brooks, a marshal at the Championship Course. "They are both just beautiful courses." It's no wonder they get a bit possessive when it comes to golf. This is a course that resides in a beautiful, serene setting, offers a challenge to any level golfer and is typically in prime-time shape. The course measures 6,931 yards from the tips. The blue tees are a more accommodating at 6,447 yards. The ladies tees go 5,196 yards. Terry Jelenic of Cameron Park, CA., played the Championship Course for the first time this summer and expects to return. "I liked everything about it, the scenery, the nice atmosphere, the courteous staff and naturally the golf course," he said. "I liked the way the course set up, it's a beautiful layout." There are rises in elevation, going to a height of 6,500 feet. The fairways are tight at times and friendly in other spots. Majestic pine trees add to the beauty and the difficulty. Accuracy is crucial on many shots and distance is also required at times. Fairway bunkers and creeks (especially on the front side) add to the challenge. The greens are frequently bunkered and lateral water hazards are something to observe closely. The greens were in great shape and moved quickly, especially in the afternoon. Beware of subtle breaks. The greens are tougher to read than they appear. "I thought the greens were awesome," said Rob Maye, a visitor from Elk Grove, CA. "They were fast and I liked the way they held your shot." A beautiful first hole awaits, an obliging par-4 that goes 364 yards (all yardage quotes are from the blue tees). It's a nice starting hole, not too tough. A short iron will follow a well-hit driver. Beware of the small, hidden creek in front. It has a ravenous appetite for golf balls. At No. 2, a choice awaits on a short par-5 that measures 487 yards. It's the familiar risk-reward on the second shot. Go for the green on the second shot and the creek awaits any failure. Smart play would be laying up and chipping on to the small green. The third hole requires extreme accuracy off the tee, about 210 yards is all. A demanding second shot awaits with a creek and huge bunker putting a scare into many golfers. The runs off Diamond Peak Ski Resort stare golfers in the face at fourth hole. Unlike the previous par-5, this one goes long, an even 600 yards. Don't get greedy, keep the ball straight, and the course's No. 1 handicap hole seems less intimidating. Give yourself plenty of club at No. 6, a par-3 that goes 176 yards. It's a gorgeous hole, but can turn ugly if your tee shot lands short and takes a splash in the water. The water carry is sizeable. Keep the tee shot left on No. 6 and be ready to deliver an accurate iron to the undulating green. The fairway grows a bit narrow at No. 7, another par-4 that features a narrow and deep green. Go long on the par-3 (146 yards) at the eighth hole and the result is a waterlogged ball. Might go a club less here. Head back to the clubhouse with a demanding par-4 that runs uphill. The ninth hole measures 402 yards, but definitely plays longer. Get a par here and you've done a nice job. Don't get too sidetracked with lunch at the turn, some difficult holes remain. "There is a change of elevation, the front side is more down low," Brooks said. "There are some tough holes on the backside that are high up." Cut the corner at No. 10 and this dogleg right hole can be a breeze. It measures 352 yards, but does go uphill. The 11th hole offers another birdie opportunity, a mere 456 yards away. The fairway is wide open so swing away. A test awaits at the 12th, the second toughest hole on the course. The par-4 goes 395 yards and two intimidating traps act as bodyguards around the green. No. 13 is no easy trip, either. The par-4 hole has a fairway that slopes to the left. For the birdie-seeker who can get off the tee, another short par-5 awaits at No. 14. This one is 449 yards away. Take note of the green that runs sharply downhill. Stay short on the approach. There are many signature holes on the course; this one is probably the most notable. The 15th hole requires a shot over a large canyon into a relatively small green. Club selection crucial on this par-3 (176 yards). A dogleg right at the 16th should be treated like the No. 3 hole. Don't let a perfect view of Lake Tahoe distract your thinking off the tee. A 3-wood or less is the way to go, which should lead to a short iron into the green. A formidable downhill par-3 arrives at No. 17. It's redundant, but pick the right club. A nice hit is required to reach the green, 182 yards away. Considering the course's beauty and the number of challenging holes, the 18th is a mild disappointment. It's not a great finishing hole (363 yards), but don't be lulled asleep. Work the tee shot left to right and the reward is a short iron to the green. Jeffrey Weidel has been working in the Sacramento area as a sportswriter since 1981. An avid golfer with a 10.6 index, he is currently the Assistant Sports Editor of The Press-Tribune, a three-day a week paper in Roseville.